There is a loveliness to Wriphe that does not fade. That doesn't happen often. I think the last time I was sick was last spring. Once a year seems about right. 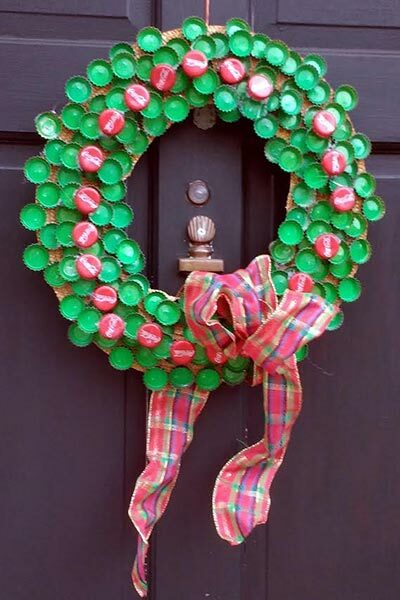 The only good thing about being sick is it give me an excuse to post this picture of an awesome wreath that friend Cam made last year out of Coca-Cola bottle caps. When I do die (which won't happen from this illness, but is, sooner or later, inevitable), I don't want flowers. I want wreathes of Coke caps. I'm super jealous that Cam finds time to make such cool art, while all I'm doing with my free time between coding video games is writing novels and getting sick. Obviously, I need to do something about my priorities. thank you for the compliment!! your approval means a great deal to me. If you had eight comic books and I took away seven, how many would you have? Afterwards, if I gave you three more comic books, how many would you end up with?